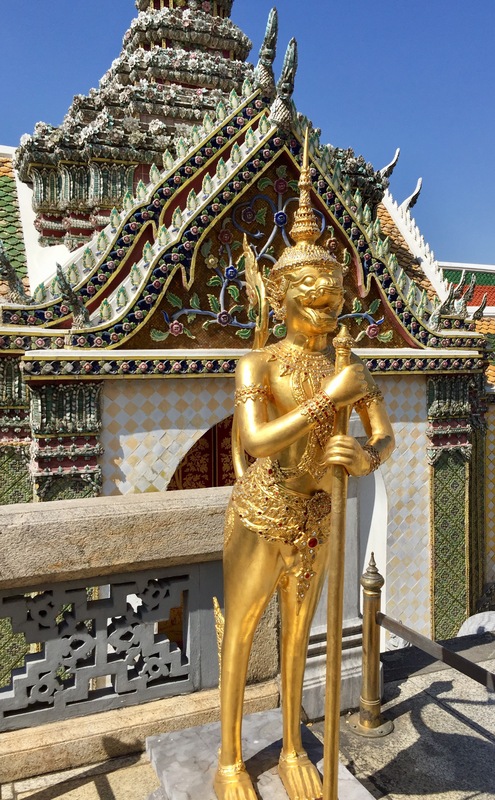 For our third and last full day in Bangkok on this leg of the trip, we knew we had to visit the Grand Palace and Wat Po, which are in close proximity to each other. 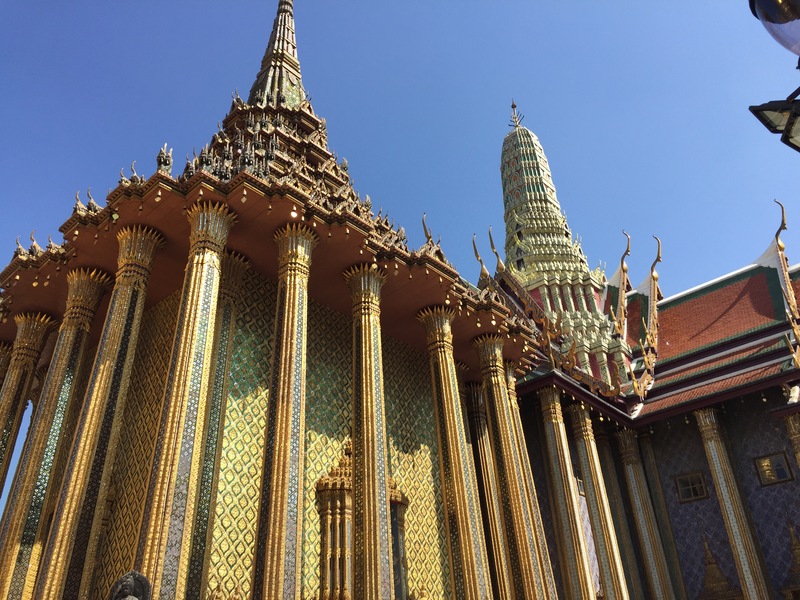 Since we learned how to navigate the ferry on our first day, we knew exactly how to get to the Grand Palace and set off after an early breakfast at the hotel. 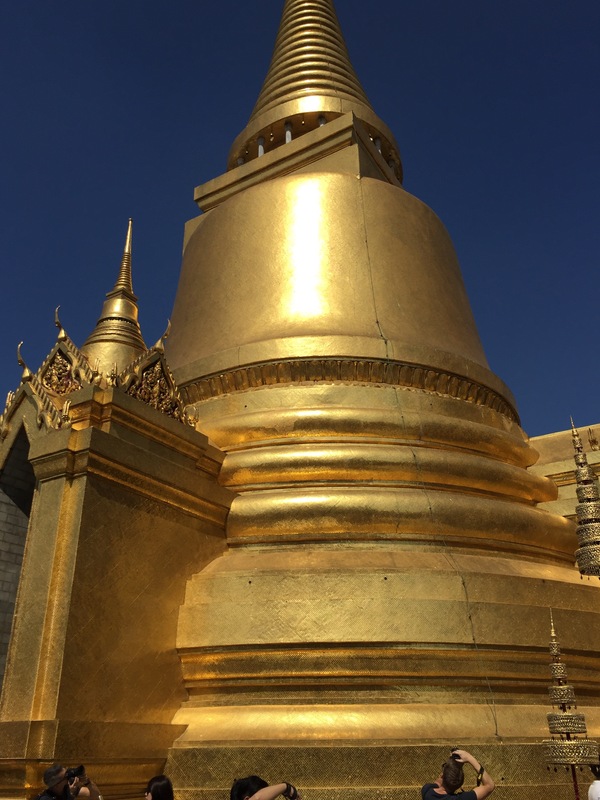 I’m sure the Grand Palace is busy with tourists at any time of year, but with the recent passing of King Bhumibol Adulyadej it was really crazy. And hot. 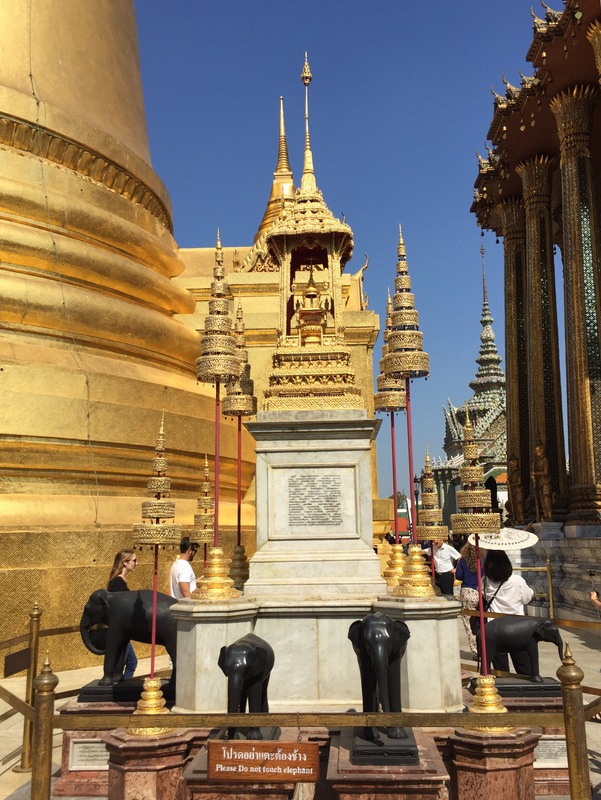 This may have been the hottest day of our vacation, but we dressed in black and toured the Grand Palace complex as fully as the crowds allowed. It was well worth it. A grand sight for sure, with each building seemingly more gilded and ornate than the last. If you blocked out the noisy crowds and just looked up, there was a serene beauty to the wats and other palace buildings, and you could just begin to imagine wandering around these grounds three hundred years ago. We had a quick lunch at the Royal Navy cafeteria, which had been recommended in one of our guidebooks and was surprisingly good. I ordered a glass noodle salad, and Rob had the ubiquitous gai gaprow (aka gai ka phrao…there are several variations on the spelling of this dish), though in reality all meals we shared back and forth as we both love the same things. We also split a large Chang beer–a large, shareable bottle seemed to be the only way this was served, other than on draft, which was rare. The total cost for everything was just 410 THB, or about $12. 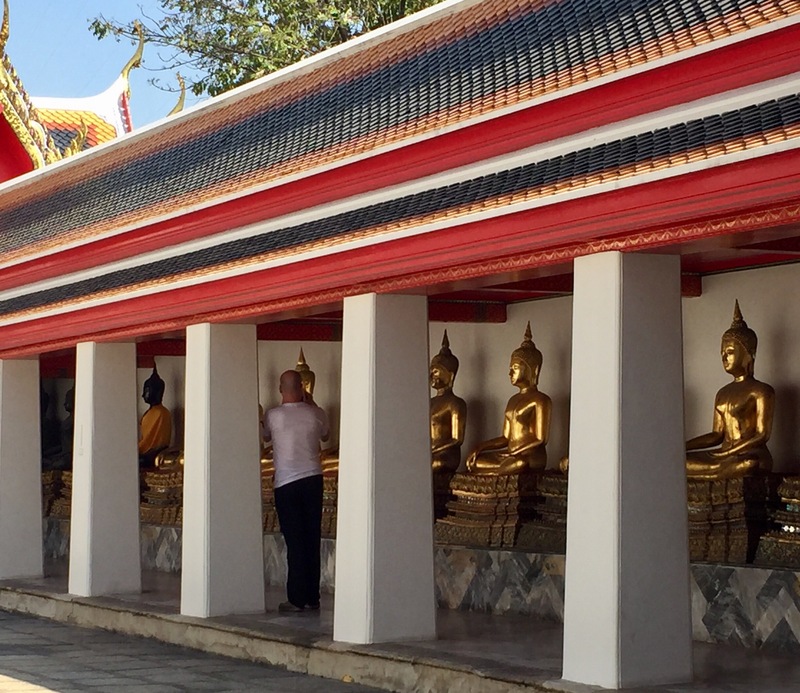 We then made our way to Wat Po (aka Wat Phra Chetuphon Vimolmangklararm Rajwaramahavihar, aka Temple of the Reclining Buddha), which is considered the first public university of Thailand, as well as the home of Thai massage. 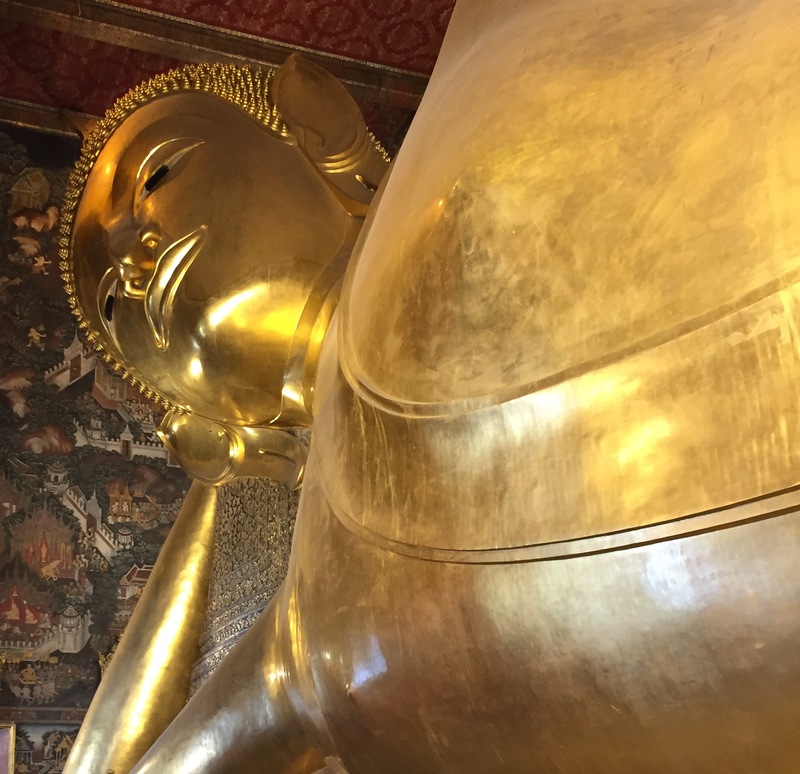 Before our massage, we knew we had to brave the crowds for a look at the Reclining Buddha, for which there was a massive, massive queue. But it moved along quickly (mostly because they didn’t let you dawdle inside), and really, it IS impressive. We checked into the massage school, where they ask what service(s) you want and then give you a number. We opted for the full hour Thai body massage (there were different lengths of time and also a foot massage option). 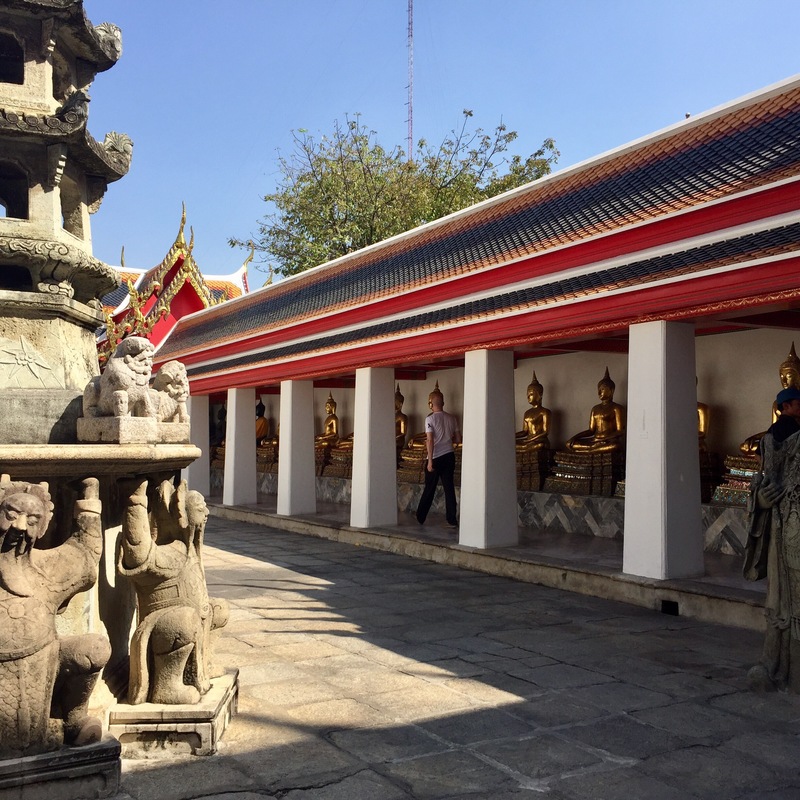 We had about a 40 minute wait, which was ample time to stroll around the relatively (compared with the palace) empty wat grounds, and stumble upon some monks at work weaving and rolling balls of yarn. So: the massage. Yes, it was very much worth the wait. It was our first massage in Thailand but would definitely not be our last. Total cost 840 THB, or about $23 USD. FOR BOTH OF US. We need to move here. After the decadent massage, we wanted to stay in that part of the city for a bit, and maybe find a place to sit near the river with views of Wat Arun, which we visited on our first day. 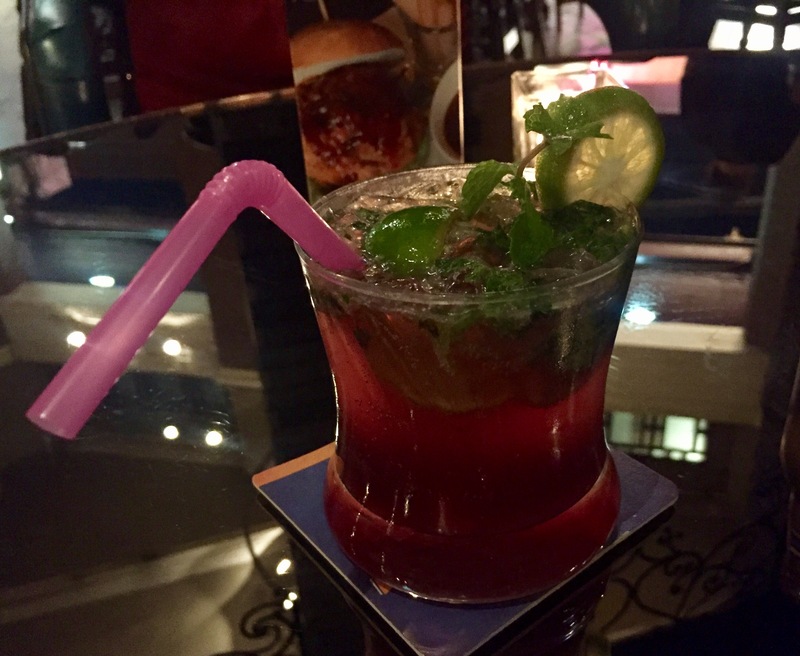 We found the perfect spot at Sala Arun, a nearby hotel right on the river with a street-level restaurant and lounge. We talked them into letting us take a table right at the edge of the deck that was normally reserved for dining and ordered two glasses of wine. The timing was perfect for the view, the setting sun, and watching the river life. After our leisurely drink along the river, we were ready to head back to Chinatown. But a quick look at the ferry stop informed us we would not be getting home anytime soon, as the queue for the boat was well over 50 people long, and not moving. We had been on our feet sightseeing most of the day, so were not keen to stand for very long. Plan b: a tuk-tuk. For our last night in Chinatown (we’d be returning to a different part of Bangkok later), we decided to graze a bit. 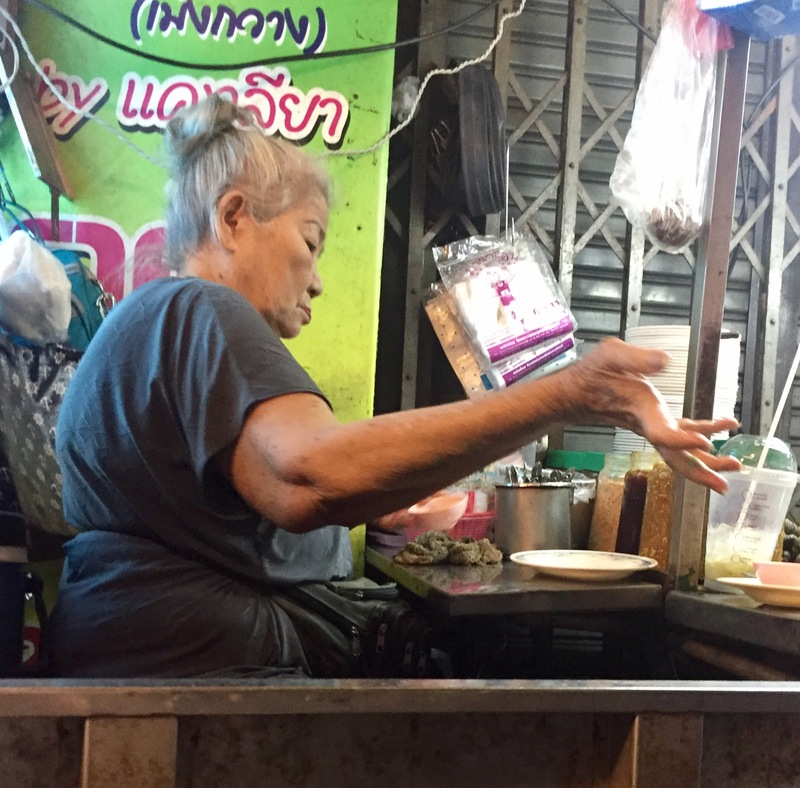 We went back to one of the street stalls from the walking tour serving an addicting soup called kuay jab, with rolled rice noodles, pork belly and a broth with a breathtaking amount of white pepper (50THB per bowl). If this didn’t kill off any cold germs I don’t know what would. 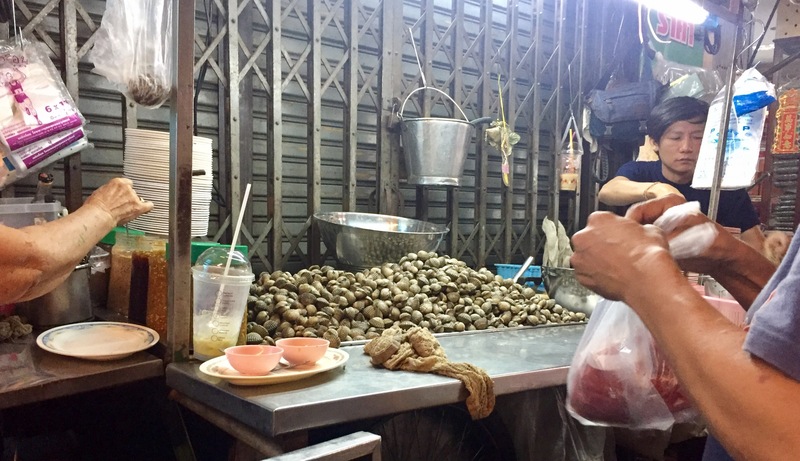 After that, we managed to find a stall along a side street we had heard of that served blood cockles–so called because when steamed and opened, the broth inside was bright red. Like many steamed shellfish, the flavor was more in the spicy and delicious cilantro lime chili dipping sauce served with it. (100THB for the plate). 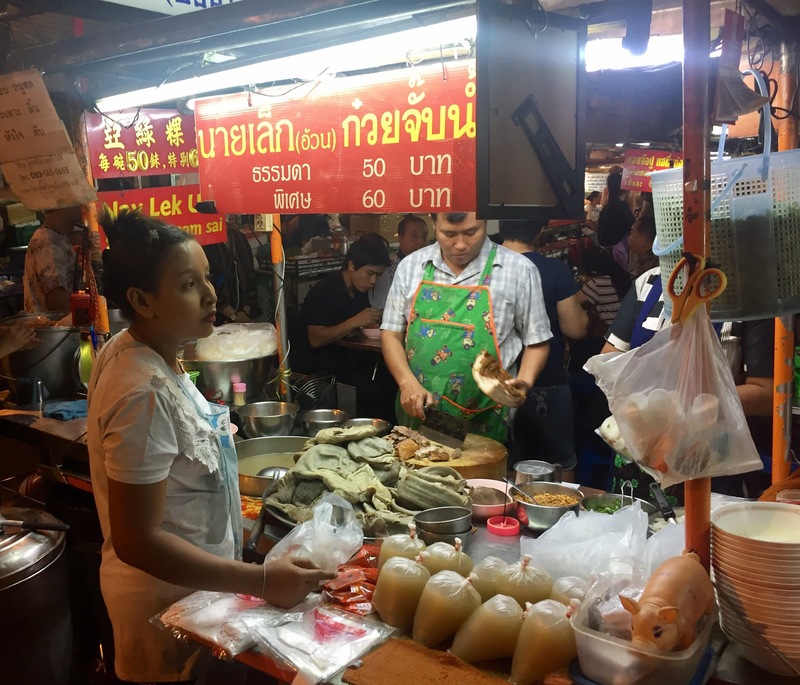 Both street stalls were a fun experience, as we managed to figure out the etiquette and how to order (very little English was spoken at the street stalls). A last evening back at our hotel listening to jazz music with a cocktail, and then we were off to Chiang Mai in the morning.